Own Your Solar Panels Now! Have you ever considered installing solar for your home but assumed that it was too expensive? Or maybe you are waiting until the solar technology improves and its cost goes down? Then, I should advise you to wait no longer! 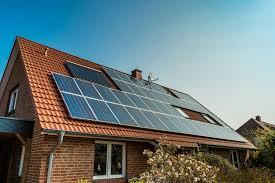 It is high time that you jump on the solar bandwagon and have solar panels installed in your home! Here are 5 reasons why! The billing price for energy has quite boosted in many areas and increases are assumed to continue for the years to come. In your calculations about the affordability of solar, do not even forget to take into consideration how much more you might be paying for your home’s electricity for the next 10 or 20 years. Why would you want to pay larger amounts for your electricity, if you can have your roof filled with solar panels to cover at least half of your energy use? And if you can install a system which can cover all the energy needs, then you can have a lot more savings than now, right? For the last few years, in order to have a solar panel installed in your home, you needed to have a lot of cash in order to pay the huge upfront cost which could be tens of thousands of dollars. However, we have seen a steep drop in prices over the recent years. Furthermore, there is a number of financing and rebate programs which have put solar in reach for more homes. The United States federal rebate of 30 percent was extended through next year, after which it should fall by 4 percent every year and get phased out in the year 2022. Installers in your area can help you in figuring out which programs can give you the greatest return for a particular situation. But, as more people join the solar revolution, most of these rebate programs can become too costly to sustain, causing many states to cut back the rebate programs. So, if you wish to take advantage of such great incentive, then it is smart that you have solar panels installed now than later. The technological improvements which excite people in the solar industry are the very same reasons for the lowered cost of solar energy. Innovations in the supporting tools which are used for installing solar panels have greatly simplified the installation process, thus reducing the installation cost. The use of single micro-inverters on each panel instead of a single inverter for the entire solar energy system can keep your system running, even if a single panel gets shaded or malfunctioned. Such innovation provided greater energy production. Furthermore, Tesla unveils a new and improved Powerwall battery for small businesses and homes that should be able to store the energy from the sun during the day and the same energy at night. According to them, it should be able to power a 2-bedroom home for a single day. Even if you install a solar energy system without enough storage capacity, net metering laws in most states mean that energy companies are forced to pay you for the electrons that your solar system feeds back to the grid. Since power companies buy whatever excess energy you make in retail rate, you can only pay for the energy you use over and above what your panels produce. Our Mother Earth continues to suffer from the industry as well as household emissions. However, with solar electricity, we can reduce our contribution to climate warming emissions. Household energy use generates the second largest greenhouse gas emissions. However, if you cover your home’s electricity with solar power, then you can reduce a sizeable amount of your emissions. A common application is using solar water heating systems at your residence. About the Author: This article is written by Jason Philips. Jason loves to write about environmental and social issues.